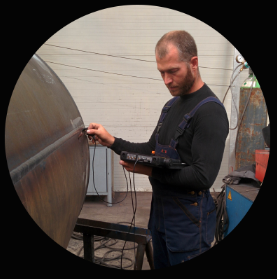 Ultrasonic testing is one of the basic non-destructive testing methods. This method can be used to determine surface and bulk defects – bubbles, cracks, pores, root joints of weld joints, cold joints, etc. The method also allows measurement of the thickness or structure of the material or the detection of material loss. Use of the UT method is not limited to steel – it is also possible to test other metallic materials, plastics, rubber, ceramics, wood, concrete, etc. The essence of the UT method is the ultrasound wave sent to the checked material, which reflects off each inhomogeneity in the material. Non-homogeneity is understood to mean any internal or surface defect. The most frequently used ultrasonic method is the impulse pulse method – a short ultrasonic pulse is transmitted through the probe and acoustic coupling to the test material. We also provide UT material testing to the most advanced ultrasonic technique, „PHASED ARRAY“. This method allows the checking of components with complex geometry, checking of a much larger area of ​​the object to be tested, better spatial resolution and more accurate defect assessment.